A recent study by scientists at Imperial College London has revealed for the first time how the brain behaves during an LSD induced experience. 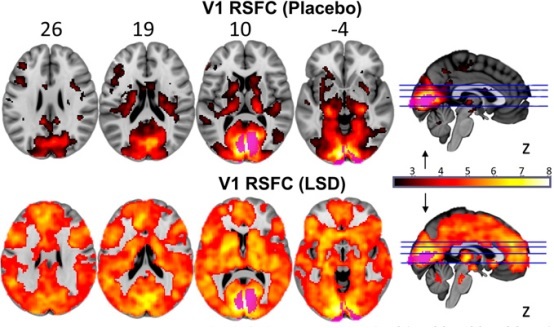 The study, led by David J. Nutt, involved fMRI scans of subjects who had taken LSD and compared them with others who had been given a placebo. A major finding of the study was that while on LSD, the entire brain was involved in processing the visual imagery, not just the visual cortex. Most areas of the brain, in both hemispheres became active. In a summary of the study by Imperial College, Dr Robin Carhart-Harris, said: We observed brain changes under LSD that suggested our volunteers were ‘seeing with their eyes shut’ – albeit they were seeing things from their imagination rather than from the outside world. We saw that many more areas of the brain than normal were contributing to visual processing under LSD – even though the volunteers’ eyes were closed. Furthermore, the size of this effect correlated with volunteers’ ratings of complex, dreamlike visions. The paper goes on to say, It seems increasingly evident that psychedelics reduce the stability and integrity of well-established brain networks … and simultaneously reduce the degree of separateness or segregation between them … that is, they induce network disintegration and desegregation. Importantly, these effects are consistent with the more general principle that cortical brain activity becomes more “entropic” under psychedelics. In other words, the brain’s ability to organize and segregate information that it receives is vastly reduced under the influence of LSD. The brain is flooded with information and has little ability to stem the flow. This view of the brain is not far from that expressed Aldous Huxley in “The Doors of Perception”, where he describes the brain as a throttle that slows down the flow of information it receives so that we can function more effectively in the “real world”. Our survival in the past depended more on escaping from a tiger than on feeling at one with nature. When the throttle is opened, we are able to see new relationships in ways that are not normally possible and a diminishing of the role of the ego. The study also references “network disintegration and segregation” as one effect of LSD, which may explain psychotic behaviour that accompanies repeated drug use. David Nutt said, Scientists have waited 50 years for this moment – the revealing of how LSD alters our brain biology. For the first time we can really see what’s happening in the brain during the psychedelic state, and can better understand why LSD had such a profound impact on self-awareness in users and on music and art.